"Campus is both an aesthetically and functionally designed sofa and recliner. It invites you to relax. The head and feet areas of the sofa recliner are infinitely variable. 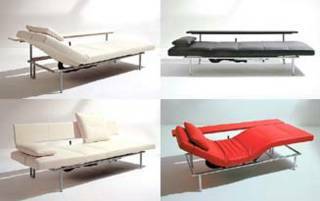 Via a very sophisticated gas pressure spring mechanism any desired position can be easily produced, it can be a comfortable three-seater, a relaxing recliner or a cozy guest bed. The backrest can be folded down, producing a place to put things or used as an armrest. Head- and footrests can be independently adjusted to any position. The light, compact frame in matt chromed stainless steel tubing integrates discreetly even in small rooms." Caveat: I haven't actually tried the Campus, which is the acid test for all furniture. But short of that, I like what I see so far. I mean, if it's at all comfortable (and affordable!) this piece looks great and is amazingly versatile. Forgetting the fact that it transforms into a bed, etc., just having a sofa that I can adjust to my comfort zone is a cut above the typical. Then you throw in the whole transformer thing along with nice styling and I'd say HED has themselves a winner here. Yes. I do aggree with you. The thing that you like must comfortable, but also need affortable for you. Am I? Sometimes I felt that, *thing* could not be exactly *satisfy* one hundred percent for us.. I can't seem to find a proce. but I'm curious about getting one. is there a way to get one without living in SF? The Cherry Red colour it comes in is neat. It'a amazing, I wanted one immediately. Love at first sight. Then I saw that she's high maintenance - around $3,600-$4,500!